From developer 17-BIT and GungHo Online Entertainment America comes the next chapter in the GALAK-Z Universe. Both GALAK-Z: Variant S and GALAK-Z: Variant Mobile deliver a brand new, one-of-a-kind, space-shooting action-RPG experience. 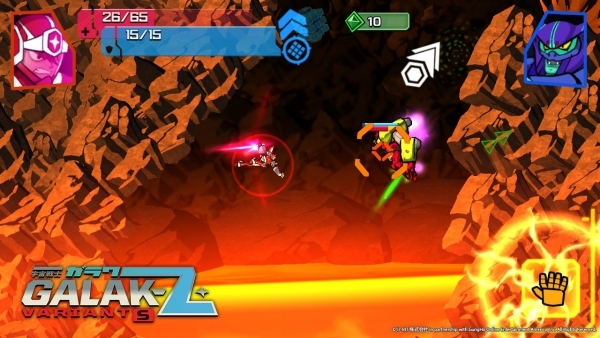 GALAK-Z: Variant S brings the experience to the Nintendo Switch. Experience stunning space combat from the cockpit of a sleek spaceship, or a giant Mech wielding a radical laser sword! Battle space pirates, squish giant bugs, challenge Dark Bot bosses, and crush the evil Baron’s army of nasty Imperial troops through more than a hundred endlessly replayable missions in a full-scale story campaign. Fight against player-created squads in the Bot Battle League and earn Trophies to reap better rewards. Collect upgrades, salvage, relics, and Bots to make your spaceship and Mech even stronger, and fight to become the highest ranked pilot in the galaxy! – To Infinity and Be Gone – Vanquish the galaxy’s most dubious enemies and fight your way through the Baron’s army of Imperial goons as you juke, blast, and hack your way through tightly-packed, beautifully-crafted environments with your nimble piloting skills. – Galactic Mech Battles – Transform into a Mech and take on the galaxy with your trusty laser sword in gripping, close-quarters combat. – Go, Fight, Win! – Clash with player-created squads in the Bot Battle League and earn trophies to reap better rewards in asynchronous multiplayer. – Another Man’s Trash… – Collect Salvage, Relics, and Bots scattered across the cosmos to upgrade your spaceship and Mech to maximize your combat-readiness. – Portable Action – Experience true gaming thrills as you blast and survive through a rich campaign with over a hundred endlessly replayable missions all on the Nintendo Switch.